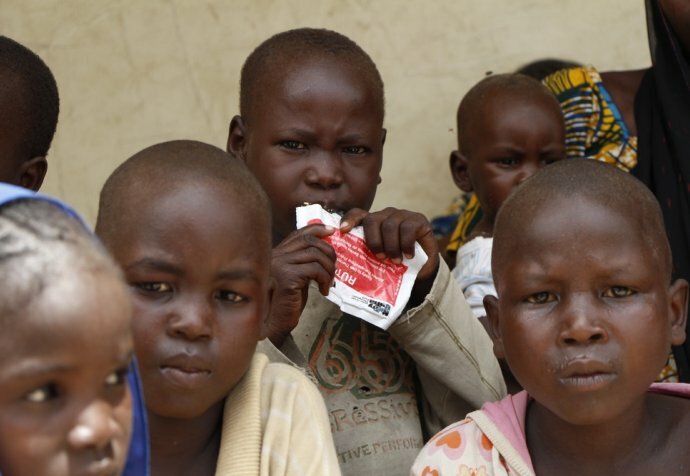 Médecins Sans Frontières runs nutrition programs in Maiduguri, north-east Nigeria – an area which has been badly affected by the conflict between Boko Haram and the Nigerian military. As Australian nurse Liam Correy writes, a storm is brewing as he and his colleagues see the last nutrition patients for the day. The gritty sensation of dust particles between my teeth is the first sign of an approaching storm. I glance up through the flapping tent door to see the tree branches above starting to wave violently. 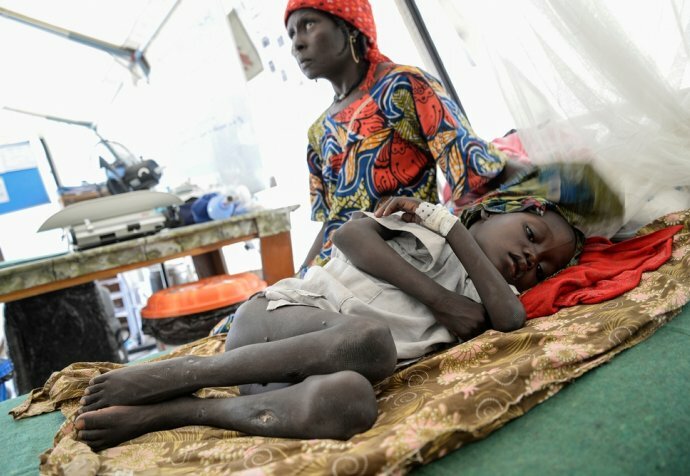 It is late afternoon and the last patients are moving through the tent in MSF’s Nutritional Program in the city of Maiduguri, Borno State, north-east Nigeria. Ten Nigerian colleagues and myself work throughout the day in this white canvas tent. A further 15 occupy the triage, registration and appetite test stations. In the tent are four nurses, two medicine dispensers, two data entry operators and two patient information recorders. Despite an elaborate, layered shade net, the temperature inside rises during the day as the hot desert sunshine penetrates everything. Three standing fans cool our sweat-drenched skin. If the power cuts, shirts stick to skin, foreheads drip, and eyes sting. "Three standing fans cool our sweat-drenched skin. If the power cuts, shirts stick to skin, foreheads drip, and eyes sting"
As the heat rises above 40 degrees, the babies start to cry. They are cocooned in colourful cloth pouches on the small of their mother’s or older sister’s backs. Some twist their heads to watch the activity while others sleep soundly. Little heads nod back and forth, and side to side. The team works hard to move the line through quickly and once they are moving again the crying fades. As I work through the day, 200 to 300 children and their caretakers pass closely by. The babies eye me curiously; the toddlers, suspiciously. I’ve learned that the slightest movement or facial expression change can provoke a three-year-old to tears. Some older children try to sneak up and touch a bit of white skin. The smiles of the caretakers are wide and warm, often framed by the nine vertical scars of the Kanuri facial scarring tradition bearing the marks of their ancestors. By the time they reach our tent they are almost at the end of the day-long wait. At this time of year, during the peak of the hunger period, they will head home with packages of peanut butter paste (Ready-to-Use Therapeutic Food, or RUTF), a sack of millet, a bag of beans, salt, flour and oil. Children are admitted into the outpatient program for regular monitoring. "Many of the men and boys from the same areas ended up dead, missing or involved in the conflict"
Most of our patients and caretakers are displaced people, who have left their home villages and subsistence farms for the security that the town’s military presence provides. Feedback from them suggests that many of the men and boys from the same areas ended up dead, missing or involved in the conflict. Women were forbidden from farming and a high risk of kidnapping led to them to flee their homes. Up to 1 million people have sought refuge in Maiduguri, doubling the size of the city. Outside the air and sky have become a dark cloud of dust. The world has transformed to sepia. The sun may as well have set, it is so dark. We rush the last of the mothers and children through the tent. The desert dust follows them leaving a thick layer across computers, files and tables, and up one’s nose and down one’s throat. We work together to shut the zippers of the tent against the wind. Gale-forced gusts batter the tent, which heaves and sighs with each blast. Most of the team are in the tent when the rain starts. Twenty of us crowd inside and breathe deeply the dust-free air that has arrived. The atmosphere is relaxed and full of humour. To move outside would be an instant soaking so we wait out the storm. The Nigerian team I shelter with makes each day here worthwhile. Their smiles, subtle words of wisdom and enthusiasm keep me coming back for more.